Creating a faster and convenient buying experience for customers has always been a crucial tactic for higher conversions. Magento has now released the new Instant Purchase feature. This allows returning customers, to purchase a product directly on the product page and completely skip the checkout process, using previously stored shipping address and payment credentials. Once a customer clicks on the ‘Instant Purchase’ button they are immediately taken to the confirmation page to complete their order. No additional details to fill out as this all fully taken care of by Magento. 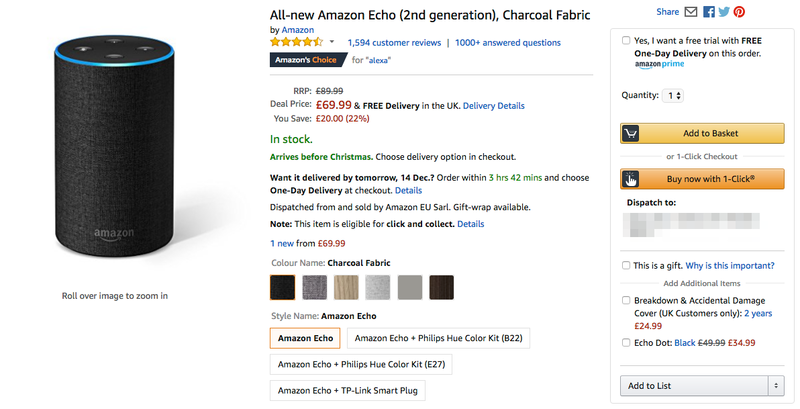 For ten years, this feature was exclusively owned by Amazon with some rivals acquiring a license from Amazon to roll out this feature on their own ecommerce store. But as of September 2017, Amazon’s patent has expired, allowing any or all merchants to adopt this feature on their own website. Magento is the first commerce leader to release the Amazon-like Instant Purchase as a standard feature. This is now available in the latest release of Magento Commerce. Merchants who have previously tested out Instant Purchase has seen the time to buy has shortened by 90 percent! With increase mobile traffic this is well suited for mobile shoppers and helps impulse buyers. The new Instant Purchase feature was contributed to the core by the Magento community. This shows the extraordinary the power of Magento community bringing new capabilities to market quickly. We’ve known about this little secret before it was made public and we’re excited to announce dotmailer will now be fully integrated with the Magento core. We’re a partner of dotmailer, a leading email marketing automation provider, allowing merchants to easily set up and start creating campaigns in minutes. 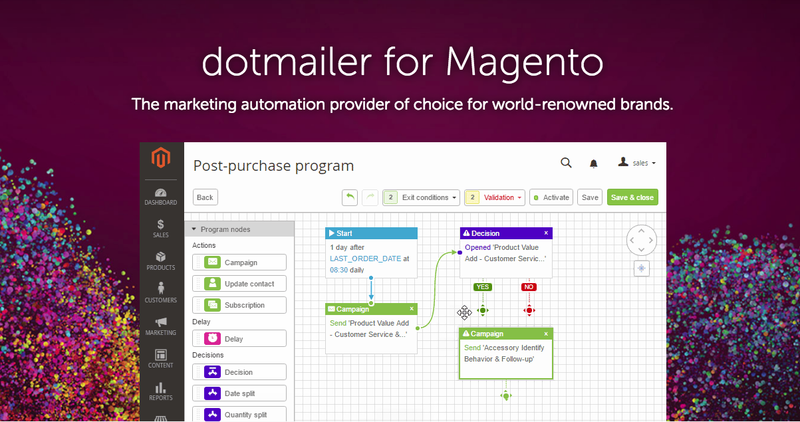 dotmailer uses Magento attributes (including custom ones) and connects with other backend systems, including Microsoft Dynamics and Salesforce, to create a complete view of the customer for highly targeted campaigns. This allows merchants to deliver smarter, faster email campaigns that maximize ROI through advanced segmentation and personalisation capabilities. This includes rescuing customer’s abandoned carts using triggered campaigns, omnichannel automation, including email and SMS. With the latest Magento release, it also comes bundled with Advanced Reporting. This provides merchants with greater efficiency and intelligence. 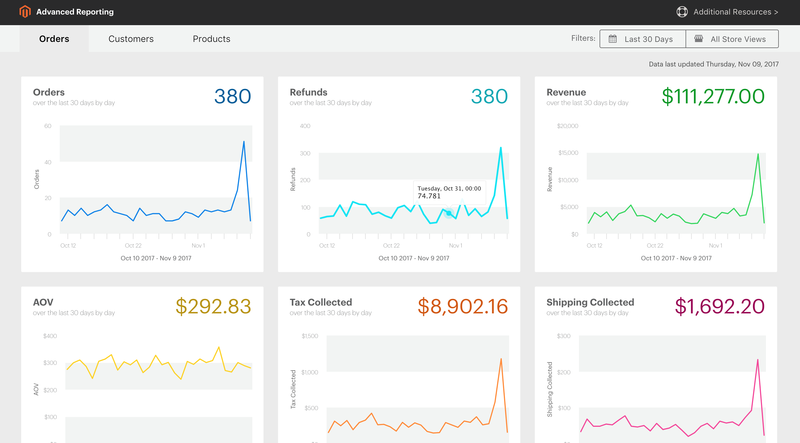 Merchants are now presented with an easy to use web interface with 20 visually compelling reports. Reports can be configured to show different date ranges from a single day to 2 years. You may also filter reports by store view, for multi-store owners. Another major improvement in Magento Commerce, is that it comes fully integrated with Magento Shipping, to provide multi-carrier shipping and fulfilment capabilities. 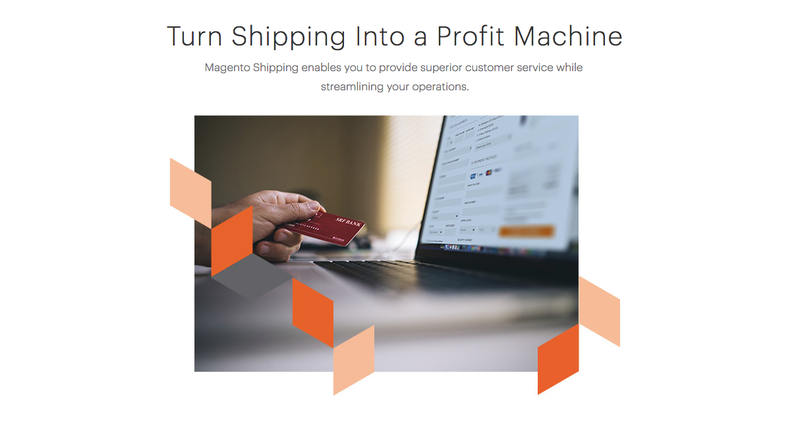 Rather than using third-party extensions, merchants can now fully control and manage shipping prices across multiple carriers directly in the Magento Admin. Want to learn more about this latest release? Want to see these features in a live demo? Join Magento’s webinar on January 18th 2018, to see all the features in action and see how customers are using Magento Commerce. If you have any questions or would like a personal demo, get in touch with us today! We can set up a call with you for a Magento demo and discuss how we can accelerate your business growth in 2018. Steven has been working in the eCommerce market for over 8 years. Specialising in Magento eCommerce development and has a passion for Wordpress. Has worked with clients such as HTC, Cisco, Hitachi, BT, Panasonic, HSBC and Natwest. Steven enjoys reading and rock climbing at the weekends.